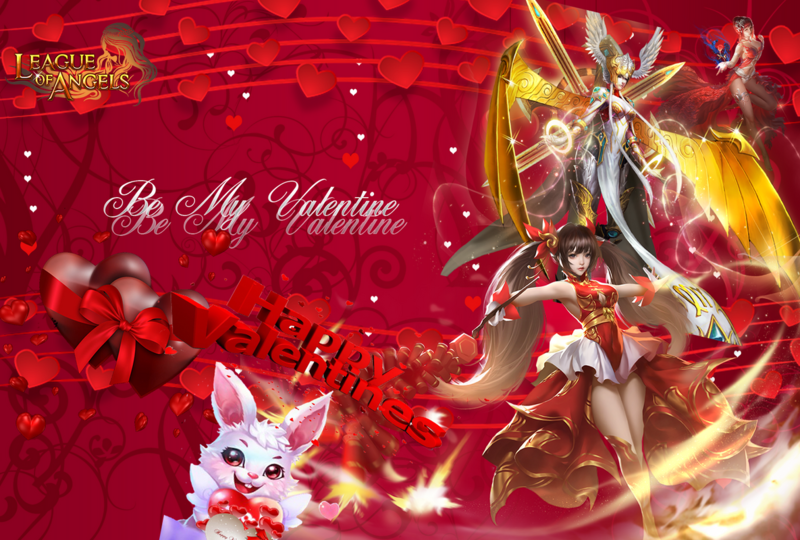 North America Forum»Forum ›League of Angels ›Tavern › [Forum Event] Be my Valentine! [Forum Event] Be my Valentine! Valentine’s Day is a time when people show feelings of love, affection and friendship. It is celebrated in many ways worldwide and falls on February 14 each year. The day focuses on love, romance, appreciation and friendship. Hearts, the colors red and pink, doves, lovebirds, roses, images and statues of cupids, and cupids’ bows and arrows symbolize the feeling of romance and love on Valentine’s Day. People who fall in love are sometimes said to be “struck by Cupid's arrow”. Love expressions, poems or quotes, boxes of chocolates, flowers, presents, special events, all mark the day and the occasion. The origins of Valentine's Day are not clear and there are different ideas as to where or how the celebration of Valentine's Day began, though. It is believed that it stems from the story of St Valentine, a Roman priest who was martyred on or around February 14 in the year 270 CE. The Roman's celebrated a festival called Lupercalia on February 15. This festival was held to ward off the danger of wolves to their flocks and honored their God Lupercalia. The Christian Church had two Saints named Valentine and two other ideas center around them. The Roman Emperor, Claudius the II forbade young men to marry in 200 A.D. He believed single men made better soldiers, free of family concerns. A priest named Valentine disobeyed the Emperor and married couples in secret. The next Saint Valentine was a lover of children but, was imprisoned when he would not honor other gods. He was executed on February 14, 269 A.D. Pope Gelasius in 496 A.D. named February 14th, Valentine's Day, after him. The fourth idea concerning the celebration of Valentine's Day is based on the belief that birds or fowl pick their mates on February 14th. It was believed love birds in particular, chose this day to begin mating. The messages of affection children missing their f a t h e r wrote then threw through the bars of his cell may have been the beginning of exchanging messages. Still, a Frenchman, Charles, Duke of Orleans, captured by the English during the battle of Agincourt in 1415, is credited with writing the first Valentine. On Valentine's Day he sent his wife a rhyming love letter from the tower of London, where he was imprisoned. The custom of sending anonymous cards or messages to those whom one admired became the accepted way of celebrating Valentine’s Day. Today, people exchange cards with symbols of love and affection on them. Children and adults use various colors of printer paper to make distinct handmade cards for special people in their life. Glitter, markers and pictures can add special sparkle to any card. Many people like to place these cards in strange spots for their loved one to find, like in or on a refrigerator, on a mirror, on a computer or on a pillow. HOW DO WE PROPOSE YOU TO CELEBRATE THE DAY? Let's just celebrate together this day on LOA! How? Nothing else easier and simplier than that! Two ... "tasks" are there for you to fulfil . A. Choose two characters in game (heroes, sylphs, fairies) as a ... couple. Show us the "love message" one would send and the reply the other would come with. Be as funny and as inventive and creative you can be . B. Write a "love letter" or "love message" to your beloved (in real life or in game). Post it. It can have any form, be written on paper, be a mail, a note, a card, ... anything! Tell and show us what "gift" would accompany your message. It is compulsory to post your data (IGN, server name and number, platform) on BOTH your post and your "creation" - if the "gift" to accompany the message or the letter is also your own vreation (created or made by you) make sure you place and make visible, next to it, a piece of paper with your data. Reply with "the love message/note/letter" and the pic/screenshot of your creation. It is compulsory to "solve" both parts/tasks proposed. You can add pics, drawings, photos, a card, symbols, etc., just as to make everything funnier and more entertaining and "lovable". It is compulsory to post your IGN, server name and number, platform, in BOTH your post and on your uploaded pics/screenshots/creations. You can participate only once per forum account and IGN, so choose wisely which of your characters you want to participate with. Only replies posted within the event duration will be counted. Spamming and unrelated replies to the topic/s of the event will be deleted. Swearing, insults, vulgar language, bad or rude words, any copycat reply, are not permitted/allowed and using them will result in deletion of the post and the ban of the forum account for the duration of the event. ALL rewards will be sent when event ends, within a few days after. All participants who meet the requirements of the event and follow the rules of it will receive a participation reward. NOTE: Please be patient with the sending of rewards, no one will be skipped or left aside, every participant meeting the requirements of the event and entering the winners list will receive his/her prize! Which last-minute gift would you choose for your Valentine? Touching words there. Dropped by to remind you that there are ... two tasks to be solved . Good luck with the event and Happy Valentine's Day, in advance! Please check your forum PM! "For me, every day is Valentine's Day. Because I always love you. anywhere, anytime, and forever it will be like that. Happy Valentine's Day, my dear!" Only dropped by to remind you there are two tasks to be solved for event . Good luck and Happy Valentine's Day, in advance! It looks like there might be some love sparks between Kensei and Fairy Prophet. And don't forget to love yourself. Sweet macarons should be a perfect Valentine's treat. And you filed my heart with joy and hapiness. My gift for you would be those roses on picture. Chocolate candies and fresh flower bouquets are truly sweet and delightful. However, nothing is as sweet and delightful as you are. Happy Valentine’s Day! Ashmonger asked Demonic Warden to be his valentine. So she replied, "ok, as long as you let me do the taunting". My in game love is Winter's Princess. Winter's Princess, please be my Valentine. You are so good looking and powerful I just can't stay away. Please be my Valentine. Here is a box of chocolates. The Son of Flames kneeled before the Supreme Oracle and said, "Fair lady, the only thing that burns brighter than my flaming sword is my love for you!!! will you be my valentine?" The Supreme Oracle replied, "yes my love, I have seen the future in crystal orb and we will be together for the rest of our lives." It was a silent love that became big towards time..
ehehe im glad you have witnessed their beginning! B.My gift for my ''dearly beloved'' is a trip to japan, that always wanted! 2019-4-23 00:47 GMT+8 , Processed in 0.070753 second(s), 55 queries .